Photo: Winemarker, Alain Freyburger and vineyard manager, Michel Ottermann, checking the potential of the Riesling Late Harvest 2014 in the Kitterlé Grand Cru vineyard. 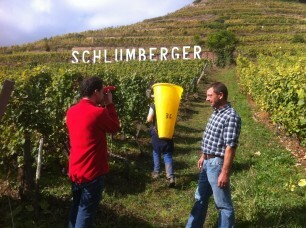 Harvest 2014 at Domaines Schlumberger began on 10th September with the grapes for ‘Les Princes Abbés’ followed by the ‘Grand Cru’, and should finish on 24th October, with the ‘Late Harvest’. At the beginning of harvest, Schlumberger were concerned due to an attack of ‘drosophila suzukii’, a new bug, occurring more frequently in the vineyards, as a result of winter temperatures not dropping as much as in previous years. The warmer conditions are ideal for the bug, which attacks the grapes, giving a vinegary taste to the juice. The weather was also a concern with warm temperatures and sudden rain showers, which made for a difficult harvest in terms of timing. Fortunately, the conditions improved for the Grand Cru harvest. “We were lucky that it was a large crop as we have made a stringent selection of the grapes, eliminating any imperfections so we should be fine, although it has required more work in the cellar than in a ‘classic’ vintage says Severine Schlumberger. “It has been one of those years that reminds us that we are not the decision makers in agriculture, nature is, but something Schlumberger is very used to dealing with”.